I recently completed a project where the client asked me to design a pie chart which can be filled with colors according to selections made by the user. Each pie slice represents a task which the user had to complete. 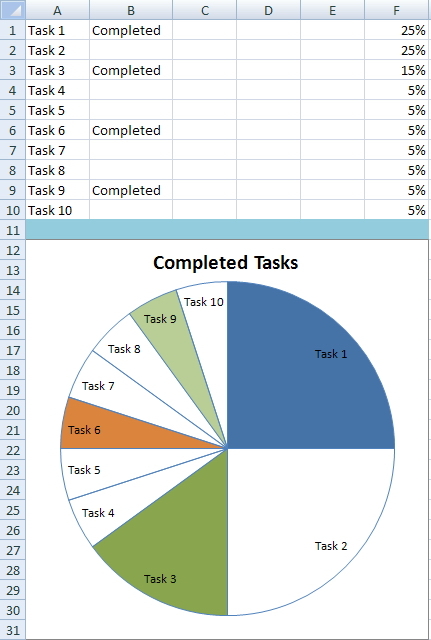 Once the user marks a task as "Completed" the pie slice should be filled with color, otherwise the slice should be white. Each task has a different importance and the client wanted the pie slices to be sized accordingly. Column A - The list of tasks. Column B - The status set by the user for each task. Column F - Relative importance of each task (in percentage). Determines the size of the slices. Because the code resides in the sheet module under the Worksheet_change event, every task which the user changes to "completed" is being updated dynamically in the chart. If the user clears the "completed" status, the slice of that certain task would return to be white. Insiders will shortly receive from Eric the file which contains this chart.